Stephanie K. Sanders is an assistant professor of music, the associate director of the very popular Spartan Legion Band and the Norfolk State Jazz Ensemble. This Spartan Spotlight shines on someone well known in the Fine Arts building. She is an assistant professor of music, the associate director of the very popular Spartan Legion Band and the Norfolk State Jazz Ensemble. 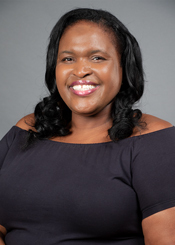 She obtained her Bachelors Degree in Music Education from Jackson State University and received her Master’s Degree in Music Performance on the Bassoon from the University of Houston. When Sanders was in the 4th grade her mother purchased her a piano, which she still has to this day, and that began her love for music. She has always been surrounded by music. Her mother played clarinet in a band. Also, Sanders always knew that music was her passion and eventually would become her lively hood. Ms. Sanders is not just a professor, she’s a mentor as well. She helps students become better women and men within the Spartan Legion and afterwards. She carries herself as the Ideal Spartan: loving, encouraging, and pushing her students to their best potential. Tags: band, ensemble, jazz, Music, Norfolk State, Spartan Legion, Stephanie Sanders. Bookmark the permalink.